Dayspring Christian Academy was founded in 1986 by Michael Myers. I was surprised to find out while typing this post that Dayspring Christian Academy is a private school based out of my home county of Lancaster, PA. Daysprings mission is to assist parents in providing a wholly Christian education for their children. Dayspring uses a Principle Approach curriculum which is defined on the website as "a philosophy of education, a method of teaching and curricular approach all rolled into one. In fact the Principle Approach is a way of life." Recently Dayspring launched online class options which are available to anyone to purchase. These classes are especially great for the homeschool community. The Pilgrims Story which is the course we reviewed is a Christ centered course and recommended for children in grades 3-6. Since I always love a challenge I decided to sign up for this review even though my kids are only in Kindergarten and 1st grade. Both of my children are fascinated with the Pilgrims and the Native Americans and enjoy learning about them. So after reading details about the course and the outline of the course I decided that we would give it a try. I knew my children would enjoy several areas of the program but did have some worries about a couple of the lessons like the King Henry lesson and the Geneva Bible lesson. And OKAY I will admit it I was interested in the course for myself too. I am history buff and don't feel like I only learned about half of important history stuff in public school. When you log in there is a great introduction video which must be watched. My first impression was WOW this is cool. The awesome graphic (pictured above) and some pretty neat music is the first thing you see and hear before each lesson. The Pilgrim Story course is done in an interactive slideshow format and also has a corresponding workbook. This format definitely made it engaging enough for my 5 and 6 yr old. And those two sections I was worried about were not a problem the kids actually found the King and Queen information fascinating. The majority of the course is verbal so for young children who cannot read yet it makes it much easier. 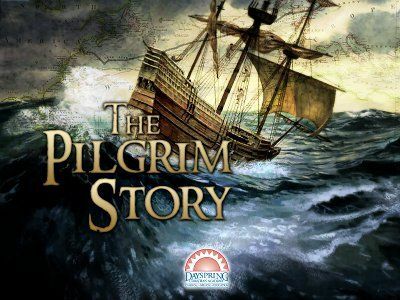 With the Pilgrim Story course you get the full story behind the pilgrims journey to the New World. I learned some pretty awesome things. Stuff I could never learn in school probably because of the religious aspect. This interactive, self-paced course consists of five units totaling 17 lessons complete with assessments and ideas for further study. Each lesson should take about 30 and 45 minutes to complete. Enrichment activities will take additional time. Since I was doing the course with young children we had to break up each lesson into 2-3 parts. There is no way to mark where you stop if you need to exit a lesson so it is important to mark where you left off which I would do in our workbook binder (more details about the workbook binder are below). I highly recommend watching the introduction as this will provide valuable information about the course set up, navigation and setting up the workbook. In the introduction details about what you can expect your children to learn are discussed. 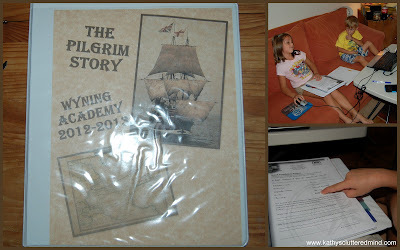 At the end of the course children will be able to retell the major events of the Pilgrim Story, define Providence and give several examples of how God cared for the Pilgrims, list four Biblical principles of government and give examples and applications of these principles, define four Christian character traits that the Pilgrims exhibited and give an example of each and write a short paragraph explaining why Christians should rejoice in our trails and hardships. Children will be able to list at least three trails that were faced by the Pilgrims. Obviously our family won't be doing all these things but I still have complete faith they are learning some valuable information. Each lesson is broken down in a similar format. There is a list of items given, reminder about the items to download, description of the lesson, a review of the previous lesson (quiz), vocabulary and then the lesson slideshow which involves listening, watching and note taking. After the lesson slideshow there are various enrichment activities and then a review of the current lesson (quiz). There are also great suggestions for further reading. The course is very easy to navigate as well and my 6 yr old had no problem navigating through the course on her own. -Contents: Has a list of all the various slides in the lesson. This makes it very easy to return to a spot you may have left off at (as long as you noted it). You can also easy navigate to a slide for review purposes (this also includes the quizzes). At the end of each unit there is a test. There is a choice between essay questions or multiple choice. Because my children are young we opted for multiple choice questions each time. I assisted the children with the quizzes and tests by rereading the questions and answers as needed. Imagine my amazement when the kids scored a 100% on the first quiz. Yup I am one proud momma!!! Unit test scores are recorded under Course Administration: Grades. It would be nice if quiz information was scored and stored there too. I would just write down their score in our workbook. Because of my children's ages they definitely needed my assistance with reading items that were not auditory and filling out the various worksheets. Older children though would be able to complete this course independently though. The course is very easy to navigate and my 6 yr old had no problem with the controls. If there was something that needed to be read to them or something that needed to be written in the notebook I just did it for them. 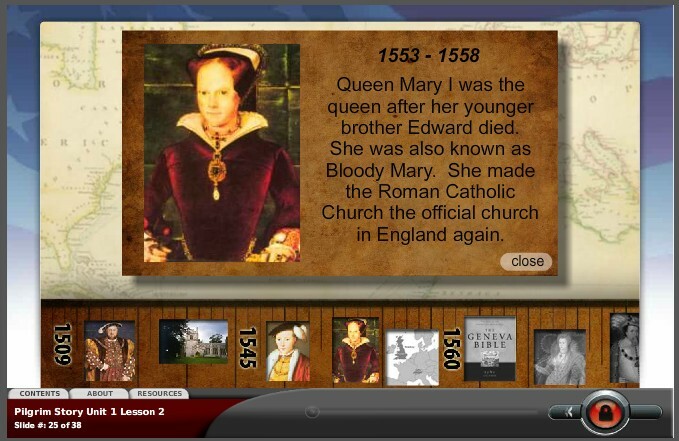 But the interactive items in the course like the timelines they did by themselves. In the introduction lots of wonderful details about the course are discussed including how to set up the binder. I decided to fully set up ours in advance because my kids are very impatient and would wonder off if I told them to wait while I printed something. The printing can be a tad bit tedious though because there is not just one large single file. Instead you must go into each lesson and print the pages. There are notebook sheets, vocabulary lists, quotes, activity pages, etc. And there are also additional enrichment activities included like writing assignments, live action, map-making, crafts and more. It is recommended to use a 1" 3 ring binder with 5 divider tabs to store the work. One divider for each of the 5 lessons.The notebook pages are very easy to fill out and great reinforcement for what is being learned. They may actually seem to easy for older children but it is not meant to stump them it is meant to reinforce what they are audibly hearing. The entire program uses a multi sensory approach. While the information is being spoken (auditory) the words will appear on the screen (visual). The items that need to be filled out on the notebook pages are underlined (kinesthetic). There are also beautiful pictures on just about every page making it even more great for visual and younger learners. If you decide to purchase The Pilgrim Story here are a few helpful items that are not mentioned in the course and will help you when first logging on. -Make sure your pop up blocker is disabled or you will get very frustrated trying to figure out why you have a blank screen. -To view the slideshow in fuller screen mode click the little arrow located in top right of the navigation bar on the left this will enable you to hide the navigation bar. -Be sure to mark ending spot if you need to exit the lesson. Even though we are not finished with the course yet, I did view the Virtual Field Trip so I could write about it in the review. 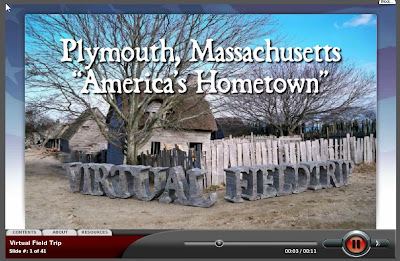 The Virtual Field Trip follows Mrs. Stauffer (a teacher at Dayspring and the author of this course) and her 3rd grade class to Plymouth, Massachusetts. There are 41 fabulous slides where children will learn about the following. I really hope that one day our family can take a trip to Massachusetts. The things I learned in the Virtual Field Trip were amazing. I hope to see more courses made by Dayspring for homeschoolers to enjoy. Only cons I really found in the course was a minor glitch which I am sure will be repaired, the difficulty of printing the workbook all at once and I wish there was a way to mark stopping points. Other than these minor cons we were EXTREMELY pleased with the course and the cost for the course (indicated below) is very reasonable for a program with this much educational information, especially if you have multiple children. I like learning about the Pilgrims. The course is fun and the pictures are neat. The Dayspring Academy Pilgrim Story course is $99.00 and will have access to the course for 6 months. For customers who purchase the course, access to the course begins within 48 hours from purchase. You will have access to the program for six months from the date of registration. The course does not meet at a specific time. You may access it at any time that is convenient to your schedule. Click here for more Dayspring Academy reviews from the The Schoolhouse Review Crew. *Disclaimer - As part of the TOS Review Crew I received a 6 month membership to Dayspring Academy in return for my honest review. Please note that prices indicated in the post are subject to change. I was not compensated for my review and all opinions are our own! Many of the links found on my side bars and in my blog posts are affiliate links. As a result, I might get paid money and I will most likely spend the money on homeschool supplies.